Shannon’s Deli has a large menu of hot or cold subs and sandwiches, amazing signature salads and homemade salad dressings. We also specialize in catering for any type of business or private event, large or small. Delivery is available in some areas. 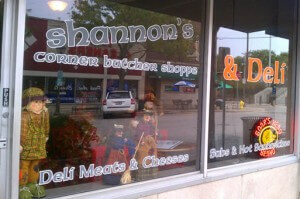 Shannon’s Corner Butcher Shoppe & Deli are proud to be a part of downtown Lombard. The butcher shoppe opened in September of 2009 under the original name of Clancy’s. The Deli opened October of 2012. Theresa is our manager and will gladly help you with any questions or help you plan any events you are planning. 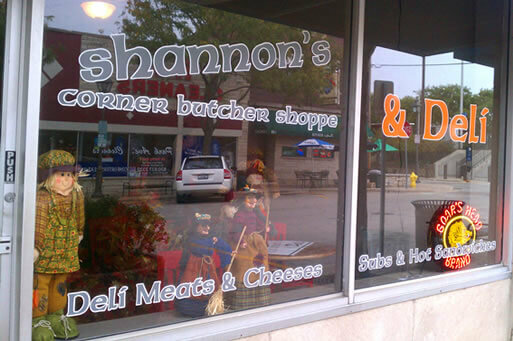 Shannon’s Corner Butcher Shoppe has a great selection of chicken, pork and choice beef. We make all our own chicken and pork sausages and grind our own burger which contains real steak trim. Shannon’s is best known for their number one selling hanger steak. It’s tender hanging tenderloin with a burgundy pepper marinade that you can’t go wrong with! Shannon’s Deli has a large menu of hot or cold subs and sandwiches. We also have some amazing signature salads which feature some of our homemade salad dressings. Every day we feature two homemade soups. Our soups have grown in popularity and we feature over 40 different soups throughout the year. Each day we feature a $5.95 lunch special which always includes your choice of soup or side. We have multiple Boar’s Head products to choose from in our deli that allows you to take home sliced meats and cheeses of your choice. We also feature homemade desserts, side salads, and prepared meals. Shannon’s Deli is the best choice for sandwiches, burgers, salads, prepares meals, soups and desserts. We also specialize in catering for any type of business or private event, large or small. Delivery is available in some areas. Shannon’s original location is located at 428 Main Street in Glen Ellyn. Shannon’s Irish Pub has been open since September of 2001. Don't miss out on our specials! Enter your email below to receive updates. Due to popular demand we now offer frozen soups for you to enjoy in your home. Available at the Corner Butcher Shoppe.